As far as long-term viticultural practices go, I believe we are already well-positioned for changes in climate with our current approach. For example, we have not changed our vine exposition since we align our vine row from east to west, which is the cooler exposition. 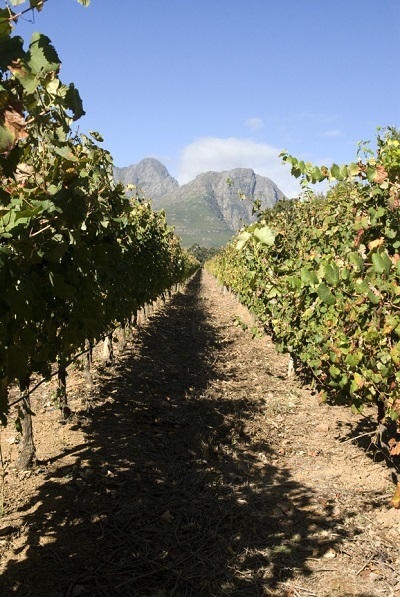 In our rich soils we still employ the weaker 101-14 rootstock to create a better canopy balance. Our soils and roots are the best buffer against climate change, but they will be affected. We specialize in cabernet sauvignon and shiraz but have decreased plantation of merlot. We have increased our inter-vine spacing in our VSP (vertical shoot positioning) vineyards to accommodate the vegetative growth better. Cover crop and mulching practices are monitored closely to ensure proper root development, which helps to buffer changes in climate. And we also use drip irrigation on a supplementary basis and farm with using NDVI (normalized different vegetation index, a form of imagery that, among other things, helps a vineyard owner to identify and capitalize on the best vineyard blocks) as a guideline. We still employ an open-canopy strategy with suckering and leaf-removal practices. We also pay attention to proper space during pruning and summer pruning. And we monitor leaf water pressure to manage irrigation and vine stress. We harvest according to growth patterns with NDVI. Phenolic ripeness is our major guide for picking, and this is where we will see changes in the future. We’ll continue to treat each vintage on its own merits, trying to find the balance between phenolics, ripeness and alcohol.